At the height of strawberry season this year, Adam and I were both happily indulging in the overabundance of strawberries on sale. Organic strawberries for $2 a pound? Yes please! We also have access to amazingly delicious heavy cream from grass-fed cows, from only an hour and a half away or so in Ohio, and it’s lightly pasteurized rather than ultra-pasteurized (keeping at least some of the beneficial bacteria that get boiled into oblivion during the high-heat pastuerization). Add to that local, raw honey, that tastes like sunshine. What does this leave you with? Isn’t it beautiful? It’s not a recipe per se, it’s more of a combination of simple ingredients. Which I suppose is technically a recipe, but you know what I mean. It’s so simple, but such a delicious combination. 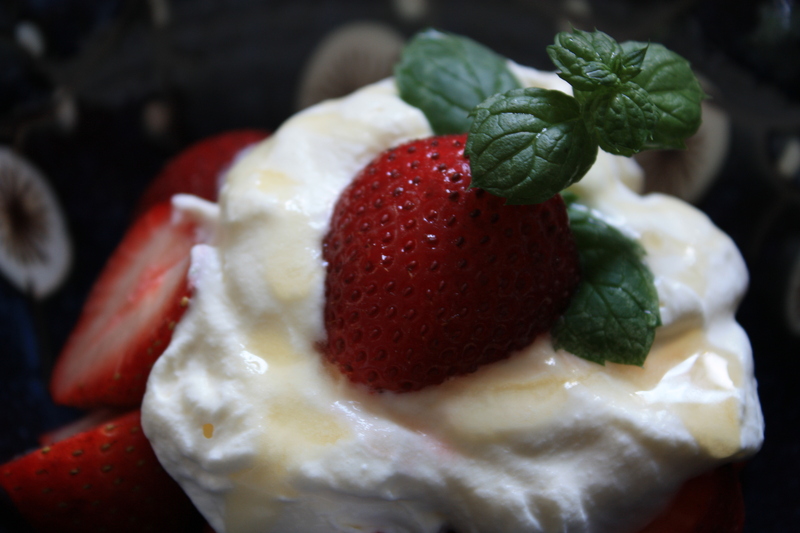 Try making the whipped cream with less sugar than usual, as the honey will add a completely different dimension of sweetness. A dash of cinnamon on top would not be unwelcome either, and if you have other berries in season right now, by all means substitute away!